Due to the holiday and slow traffic, I will resume the seasonal snow history tomorrow. Today's lack of morning clouds was no a complete miss. 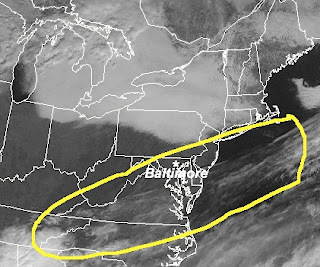 This visible satellite shows the clouds line along the vort lobe I showed yesterday- just a little farther south. I expect the cirrus and alto stratus to return later today as developing low pressure near the Gulf coast heads northeast. Tomorrow is a tough call as the NGM has a complete miss off the coast, but the NAM has us with rain. I am playing safe with clouds and showers. If the NAM is right, then we may be left with cooler temps and more showers instead of sun on Thursday as well.